The Philosopher's Stone is a legendary substance or magical touchstone, supposedly capable of transmuting inexpensive metals such as lead into gold; it was also believed to be the Elixir of life, useful for rejuvenation and possibly for achieving immortality. When applied to the human body, the Elixir cures diseases and restores youth. It has also been referred to as White Powder of Gold (ORME), Manna, and is associated with the Salt of the world. Salt is the third heavenly substance in alchemy and represents the final manifestation of the perfected Stone. The Emerald Tablet calls it "the Glory of the Whole Universe." For Paracelsus, Salt was like a balsam the body produced to shield itself from decay. It has also been associated with the Ouroboros, the Stone, and the Astral Body. In general, Salt represents the action of thought on matter, be it the One Mind acting on the One Thing of the universe or the alchemist meditating in his inner laboratory. For a long time, it was the most sought-after goal in Western alchemy. In the view of spiritual alchemy, making the philosopher's stone would bring enlightenment upon the maker and conclude the Great Work. The Great work is a seven-step formula described by the Emerald Tablet of Hermes. 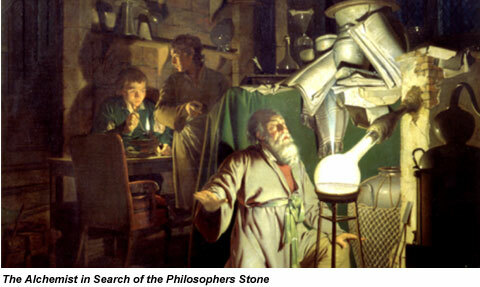 The basis of all the alchemical transformations required to obtain the Stone is thus called the Great Work. The studies of Carl Jung show it is possible to detect correspondences between alchemy and mysticism: the alchemist himself, too, was to live through the process of transmutation, and become transformed as a result. In modern day pursuits of alchemical self perfection, the Philosophers Stone is a symbol of wisdom achieved by uniting both the male manifesting side (action) and the feminine intuitive side (feeling) of our being, creating oneness and absolute balance.